The second half of the draft picked up right where the first half left off, and gave us more surprises, and another champion moved from one show to the other. If you haven’t read the first part of this column, I encourage you to do that here. We’ll now take a look at the final six picks for this year’s WWE lottery draft. What this means for RAW: Carlito certainly knows how to debut on a show. 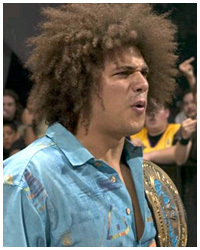 Following his debut on Smackdown, Carlito walked out with the US Championship. Now, following a trade to RAW, Carlito walked out as the Intercontinental Champion. He certainly has the ability to get over with the fans, thanks to his exception mic skills, which was really the only thing that kept him afloat when he was injured on Smackdown. The interesting thing with Carlito, however, is that he’s not one of those guys that will benefit tremendously from being on a live show as opposed to someone like John Cena, for example. Carlito is young, and not great in the ring, but he has solid fundamentals, and works hard, and has a lot of potential. It’s tempting to compare him to John Cena when Cena first broke out on Smackdown. Hopefully Carlito’s inring skills improve a bit more than Cena’s have. The problem with Carlito going to RAW, as is the case with virtually all the other draft picks, is that RAW is the more established show, with bigger names, and less room to move up the card. He has already been established as a solid midcarder, but advancing anywhere near the main event scene is something that isn’t really a possibility at this point. The potential is there with Carlito, but considering how saturated the main event market already is, this pick won’t end up being as significant as the first two. What this means for Smackdown: No offense to Carlito, but the biggest loss to come from this pick is probably that of Carlito’s Cabana. The Cabana was the standard ‘talk show’ segment on Smackdown, going up against Chris Jericho’s Highlight Reel on RAW. Now with both shows on RAW, Smackdown loses a potentially valuable segment each week. Carlito’s presence on Smackdown was a welcome one, with his character becoming a breath of fresh air and something different than what had been on Smackdown prior to his debut. However, Carlito’s injury significantly lessened the impact he probably would have made on the show had he remained healthy the entire time. As it stands, once Carlito came back from his injury, he didn’t have a whole lot to do. He picked up Matt Morgan as a sidekick to replace the defunct Jesus, but didn’t have a solid direction to head in. The US Title wasn’t an option, being in the hands of fellow heel Orlando Jordan. Therefore, Smackdown really didn’t feel the sting of losing Carlito when they did because he wasn’t a valuable commodity at the time, unlike the value of prior draft picks Angle and Cena. It’s not to say that Smackdown won’t miss the potential matchups someone like Carlito could have provided, but if there was ever a time to put Carlito on the other show, this was that time. Career Highlights: None to date. 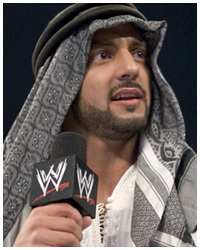 What this means for Smackdown: Muhammad Hassan is an interesting pick, to say the least, for Smackdown. He has been given a gimmick with the idea of creating massive amounts of heat. So far, he has been put in matches with some pretty big names, like Shawn Michaels and Chris Benoit. And, so far, he has failed to impress the fans during his matches. On the mic, his promos are solid, to the point, and make a lot of sense. That is when he is at his best. In the ring, however, he hasn’t been able to be as good as many people were probably expecting him to be. In actuality, his sidekick, Daivari, is much better in the ring, but doesn’t get the push Hassan does because of his size. I still think there’s potential for Hassan to turn into something useful, and I think that with some more time his work in the ring can improve and he can learn how to put together a good match. However, there certainly isn’t that same level of expectation like there was when he debuted on RAW. In the end, Smackdown could benefit greatly from this pickup, but it’s far from being a sure thing, and right now, it looks like picking up Hassan and Daivari may not result in as much of an impact as one might like to see. What this means for RAW: Watching RAW, there was never the feeling that Hassan fit in well. He cut his promos, he wrestled his matches, but something just seemed out of place. There didn’t seem to be anywhere for him to go on a long term basis. He made his rounds, wrestling all the regulars, but not really finding any quality feuds to involve himself in. A lot of that may have had to do with the fact that with all the stars on RAW, he maybe went unnoticed, due to his lack of high profile feuds. Losing Hassan really doesn’t mean a whole lot for RAW. He’s a relatively new wrestler who hasn’t stepped in and made a lasting impression. Having him move off the show won’t affect any long-term RAW plans, and if anything, frees up a midcard heel spot for someone like Carlito. Pretty minor loss for RAW that doesn’t mean much in the long run. What this means for Smackdown: The Big Show’s career is filled with many ups and downs, to be honest. He’s been at the top, getting two championship reigns, and also has been at the bottom, floundering around, jobbing to people left and right. After a very successful couple of years on Smackdown, Big Show was definitely running out of things to do. One of the main problems with someone like the Big Show is that while they can be effective, someone that size can generally only go about playing a character one way. The Big Show has feuded with virtually every midcard to main event person on the Smackdown roster, and aside from an impending return by Brock Lesnar, there aren’t a whole lot of interesting matchups for Show. Smackdown will be losing its resident ‘big man’, although the Undertaker is still available in a limited capacity. Ideally, with the loss of the Big Show, Smackdown probably could have benefited from gaining someone like Kane, as having a big guy to put over others who are getting a push is a proven method. Losing the Big Show certainly won’t be a huge loss, as there wasn’t much going for him character-wise, and the list of opponents and feuds for him was quite short. What this means for RAW: As was mentioned earlier, RAW already has Kane as far as big men goes, so picking up someone like the Big Show isn’t necessarily that important. There are certainly a lot of areas where Show can be effective, though. Big Show works better as a heel, but with all the heels on RAW right now, there isn’t a lot of room for him on that side. However, there are some aspiring heels on RAW that could definitely benefit from some sort of feud with Show. If Chris Masters were ever to improve in the ring, he could really get over with a successful feud with Show. Same thing for someone like Rob Conway, or even Rene Dupree for that matter. One of the big problems with RAW right now is that there is a lot of main event talent, which is in turn causing the midcard to really suffer. Aside from Shelton Benjamin and Carlito, there aren’t a whole lot of set in stone midcarders. Putting people over the Big Show could go a long way in getting in more established midcarders, but with the large amount of main event talent, it may not work out as well as it should. 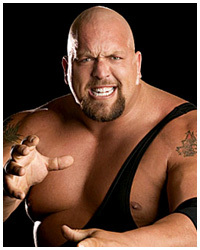 Ideally, that should be the Big Show’s role. There’s no room for him in the main event, there really aren’t any titles that would fit him right now. In the long run, Big Show definitely runs the risk of being completely forgot about, as has been shown in his first couple of weeks on the show, and this isn’t really a pick that RAW is expecting any kind of impact from. What this means for Smackdown: In short, picking up Christian is going to have great ramifications for the show in the long run. Christian has been with the company for about seven years now, and has really been one of those guys that started at the bottom and has made a name for himself. His reputation as a tag team wrestler is well-known, and he has since been able to climb the ladder and cement himself as an upper midcard wrestler. Lately, he’s been testing the main event waters, getting involved with both John Cena and Batista over the past month or so. While a title run is certainly not in the works right now for Christian, he definitely has an opportunity on Smackdown to make a name for himself in the main event. His ring work does leave something to be desired, and he’s yet to really have a great singles match. That being said, Christian’s really been improving the past year or two, and this move to Smackdown shows that management really has a lot of faith in him. He’s been put on a show that has nothing but room in the upper tier for wrestlers who are able to make a name for themselves, and Christian could very well be one of those people. If the United States title is brought back into the picture and given some importance, Christian could certainly get some good feuds out of the title, being a 3-time IC title on RAW. In the meantime, there is certainly potential with a return feud with Booker T, Christ Benoit, and maybe even a feud with Rey Mysterio somewhere down the line. All in all, Christian’s presence and charisma will definitely give Smackdown a boost, and there’s a lot of potential for where he can go on the card in the long run. What this means for RAW: As was mentioned earlier, part of the problem with RAW right now is that there is a severe lack of midcard talent. Losing Christian will only add to that problem, as he was quite possibly the strongest midcard wrestler on the show. A 3-time IC champion, his feuds with the likes of Chris Jericho and Shelton Benjamin have really done a lot to make the midcard of RAW an enjoyment to watch on PPV. Christian has been a staple on RAW for a while, so the change of scenery will be nice for the show, but overall the loss of Christian will probably be a bigger deal than the show might let on. Few people can promo like Christian, and he’s one of those guys that you can count on to work hard and get over with the fans. Definitely a big pickup for Smackdown and a significant loss for RAW. What this means for RAW: Chances are the idea of moving Van Dam to RAW does not include a main event push or a championship run. There just isn’t room, and Van Dam hasn’t been viewed as a main event threat since his involvement in the first Elimination Chamber match in 2002. Instead, this could be another opportunity for Van Dam to make an impression as a midcarder. 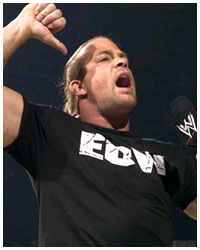 Van Dam received a huge pop upon his appearance on RAW, and he brings a reputation and credibility to the midcard scene on RAW. Like the Big Show, and Carlito, the midcard is the best place for RVD. Hopefully, RVD won’t get put back in his former position on RAW, which was that of a tag team partner with Kane in a poor and floundering tag division. The tag division is even worse, so another reign in a team would not be an effective use for Van Dam. However, as has been exhibited in the past, Van Dam is not always used to his potential, but perhaps this move means more of an emphasis on his place on the show given the reaction he got at ECW’s One Night Stand. This isn’t a huge pick for RAW, but could turn out well for them depending on how Van Dam is used. What this means for Smackdown: Having RVD drafted was a large surprise to most people. Van Dam has spent a lot of time on the injured list lately, and aside from his appearance at ECW’s One Night Stand, hasn’t been on TV in months. It’s no surprise that despite Van Dam’s ability to get over with the fans, his character is constantly limited to that of basically a stoner who doesn’t say much more than five words at a time. His matches are usually short, which for Van Dam translates to formulaic. Despite being a 5-time Intercontinental Champion, he has actually been pushed down the card the past couple of years. Over the past year or year and a half, Van Dam has basically been used only as a tag team wrestler, teaming up with people like Kane on RAW and Rey Mysterio on Smackdown. Van Dam has always been one of those guys that go against the rule of pushing who the fans want to see. He’s always very, very over, and while his matches aren’t spectacular, he’s certainly someone that could be put on the upper half of the card. However, for Smackdown, losing Van Dam won’t be that big of a deal. It’s along the lines of the Orton transaction; he’s injured, been off TV for a while, won’t really be missed, and now has the opportunity for a fresh start on a different show. What this means for Smackdown: Well, in short, Batista on Smackdown gives Smackdown back a major title. It seemed for a few weeks that Smackdown was going to be forced to create a title, a situation that would have meant certain death for the main event scene of the show. Instead, Batista swooped in at the last second and made quite a debut. Batista certainly brings a lot to the table. Over the past nine months, Batista has gone from stable lackey to main event talent. HHH all but made him with their huge feud that led to Batista winning the World Title in the main event at Wrestlemania. Batista’s size and presence has really legitimized him, and his charisma and power are really some of the deciding factors that got him over as much as he is with the fans. With the loss of John Cena, Smackdown really needed a #1 babyface on the roster. Batista had filled that role on RAW, and now has the opportunity to fill it on Smackdown, as well. There has been concern that Batista’s...attractiveness as champion was because of his opponent, HHH, so these first few months will be a real test to see if Batista can move on to new opponents and feuds and still maintain his momentum. With talks of Brock Lesnar rejoining WWE, and Smackdown being the logical brand to come back to, a Lesnar/Batista feud is probably the top money feud for Batista right now. As two men who debuted around the same time, and are both compared due to their similar size, and have both been champion as well as main-evented Wrestlemania, WWE is undoubtedly eager to make this feud something special, as long as Batista can remain on top until then. This was easily the biggest pick for Smackdown, and will lead to a big change as far as the appearance of the main event on Smackdown. What this means for RAW: While the addition of John Cena to the roster helps, there is no doubt that losing Batista is a significant loss for RAW. He was their champion, and has been in the main event of every RAW PPV this year. HHH made sure to build up Batista huge, only to have him leave to go to Smackdown. I think RAW will recover, with Cena taking over as the top babyface, but as has been apparent, the whole tempo of the show has changed drastically. Losing a champion and a main event wrestler like Batista will have a lot of ramifications, but RAW will be able to handle it given the large amount of talent already on the show. Trades, Trades, Trades: I felt obligated to briefly discuss the ramifications of the 11-person trade between RAW and Smackdown. What this means for RAW: Mark Jindrak, Kenzo Suzuki, and Hiroko were all released following the trade but before debuting on RAW, so there really isn’t anything to discuss regarding them. Rene Dupree is an interesting case, because he was actually a former member of RAW, and an original member of La Resistance. He’s never been a great worker in the ring, but his gimmick is the source of a lot of heat, so with a push he could result in a decent midcarder. The other new member to RAW is Danny Basham. There doesn’t appear to be a lot of expectations for Danny Basham. Doug was always considered the better worker of the two, and there hasn’t been any reason to think that Danny will make any kind of impact on RAW, although it’s certainly a possibility. Chavo Guerrero seems to be the winner on the Smackdown side, as he’s received a brand new gimmick, dropped his Latino heritage, and changed his name to Kerwin White. There doesn’t seem to be a definite future for White, but Chavo looks to be in line for some kind of a push, and could be an effective addition to the midcard scene. What this means for Smackdown: William Regal is an established wrestler that has made a name for himself both in WCW and WWE. He’s been pushed as a legitimate midcard wrestler before, but since a severe injury he suffered, his return has been very lethargic. There’s certainly a lot of opportunity for Regal in the midcard if Smackdown chooses to go that way. Candice was apparently a Diva Search contestant, but unless she becomes someone’s valet, don’t expect to see her anywhere except in a random diva shot backstage. Sylvan Grenier looks to be the replacement for Rene Dupree. His time in La Resistance hasn’t amounted to much on RAW, so don’t expect to see Grenier moving up the card at all. Simon Dean and Steven Richards actually appear to have a purpose on Smackdown. Richards and Dean (now Nova) joined together with the Blue Meanie to reform the Blue World Order in an attempt to go after JBL. The angle has started out in a very entertaining fashion, and while these three probably won’t see a lot of long-term success, the near future seems to point to some interesting matchups with JBL and Orlando Jordan. Wrapping up: Well, ten picks and one big trade later, and the 2005 lottery draft has come to an end. We saw both shows’ champions switch brands, and a variety of main event and midcard talent find new feuds and storylines. Both sides picked up some solid superstars, and while Smackdown will have a lot of change to deal with, WWE did a nice job of compensation for the loss of Angle and Cena. The draft definitely served its purpose, and shook up the foundation of both shows. It will be interesting to see where each show is following Wrestlemania next year when it will be time to shake things up again. Either way, the draft lottery has once again shown itself to be an effective method of adding interest to both shows. That will do it for this year’s analysis of the lottery draft; assuming there’s one in 2006, I’ll be back next year to bring you another full draft analysis. About this column: I’ve always been fascinated with the brand extension, and with the drafts, the trades, the roster jumping, etc. After having the brand extension for over three years, it’s really exciting to see someone show up on the other show, filled with a new and different purpose, and fresh new opponents and storylines waiting for them. In a time when WWE does a lot of things that don’t really interest me, this is the kind of stuff that makes me continue to watch. This is the fun stuff that I like to tune in for, where I can let my imagination run wild and wonder who’s going to go next. As always, thanks for reading.